Expectations, timeline for Friday football pep band required event. Lots of new tunes this year!! How to hem band pants. Contact Heidi Hintz for meeting dates or check the district activity calendar. If you wish to receive performance notifications, send a text to 81010 and in the text bar put "@mrshhintz". Follow the prompts to join concert band and you will get performance reminders for band. This can be a very helpful tool to get reminders for performances and fundraisers. Please print this out and complete it. When complete return to Mrs. Hintz with payment. You will recieve a FREE t-shirt courtesy of the the band parents if you march the July 4th parades. 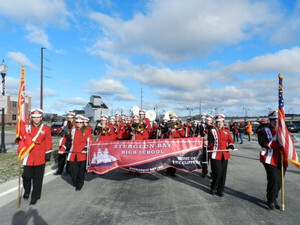 All band parents are active members of our Sturgeon Bay Band Parents Organization. This organization supports our band program by helping with events, assisting directors with tasks to keep the band program up and running. There is not a full group meeting this year as we find parents are very busy. There is a board of band parents who meet monthly and will seek your help as projects and fundraisers arise throughout the year. You can expect weekly email updates for the high school band as a constant communication. Our program doesn't function without great parent support and volunteers. We appreciate our parents and their enthusiasm. Please watch your email (the one provided in powerschool). We will communicate band parent needs via email or phone calls. Please email Mrs. Hintz if you would like more communication from the band or the band parents. All fundraisers help support scholarships for private lessons, band camps and other curricular enhancing band activities. Thank you for supporting our band program by being an active Band Parent!! Our band program functions with many parent volunteers. We can't do it without you!! Please feel free to contact Mrs. Hintz if you can volunteer for any band event. Feel free to just show up an hour before any event to volunteer as well. Band students will be selling Russ Davis Wholesale (formerly G&B Produce ---same quality assured) fruit again from Nov. 1-15. Delivery/pick up date will be December 7 @ TJWMS Gym from noon to 7 p.m. Cheesecake delivery is Saturday, Nov. 10 from 3-5 in the band room. Make sure you pick up and deliver to your customers on Saturday!!! !